Skyfall is by far the best Bond movie in the entire series! And it feels good to be able to write that! I have been a Bond fan ever since I was young and watched my first Bond movie with my dad. I actually do not remember which movie it was (but Bond was played by Sean Connery) because the following days I saw the rest of the movies in the series. I was in other words hooked early on. But everything is forgiven! 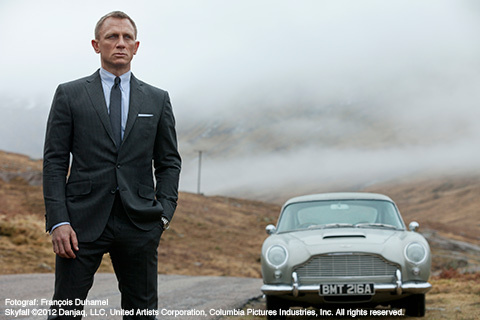 Skyfall is the way a Bond movie is supposed to be – and then some! 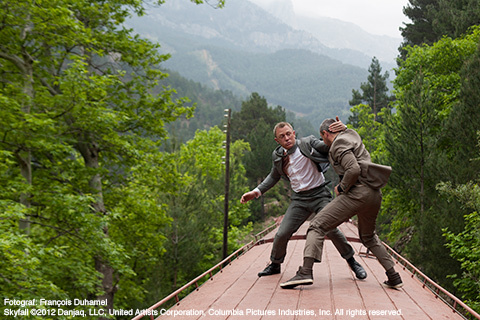 The storyline in Skyfall is among the absolute best in the entire Bond series. Of course it includes a lot of action scenes, but this time the story have a lot more heart than what we are used to seeing in a Bond movie. Then it does not hurt that the movie is filled with a lot of nods to the old classic Bond! Before I thought that Daniel Craig was an ok Bond. But in this movie something happens – he goes from being ok to being absolutely brilliant! Craig’s Bond succeeds in the feat of being super macho, vulnerable, super human and human – at the same time. Judi Dench has always been brilliant as M, she was for example the only ray of light in the last movie, Quantum of Solace. 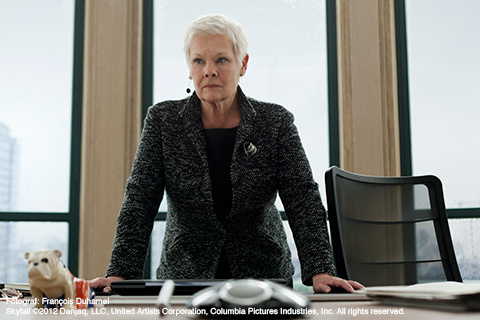 In Skyfall her character plays a much larger part and Dench does not waste this opportunity, and she continues to excel! In Sweden I do not think anyone has missed that Ola Rapace plays the role of the villain Patrice in Skyfall. His performance is good, even though he actually does not have a single line. The big star villain in Skyfall is Javier Bardem, whose interpretation of the somewhat insane Bond villain Silva is excellent. The character Q is now a young computer geek. Ben Whishaw, who plays Q, is a good actor, but here comes one of the movie’s weaknesses…everything that is about computers in the movie is not good. Parts of the movie are about hacking and it feels like they have done research by watching a few episodes of a really bad TV series. The other actors/characters are all world class, with one exception. The Bond girl Severine feels a bit dated, she could be from 1960s Bond movie. Too bad. I also have to add that Skyfall is not only a great movie, it is incredibly beautiful too. The footage is among the best I have ever seen. Wow! Adele’s Bond theme is among the best (if not the best) and last but not least, we do not give ratings here at TheCrimeHouse, but if we had Skyfall had received the highest possible! Because despite a few weaknesses Skyfall is still the best thing I have seen at the movies in a very long time. Check here for worldwide release dates.